The founder and CEO of the Vantage Collection, Nicholas David, launched a concept car for General Motors at the North American International auto show in Detroit. 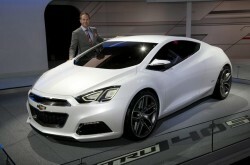 Nicholas was fortunate enough to be chosen to design a future small sports coupe for the Chevrolet brand. The design of the TRU 140S concept car was aimed at the millennial generation. Nicholas was the lead exterior designer on the project and responsible for the entire exterior design.